Shelters around the globe routinely take in more pets than they can effectively care for, but there are few alternatives when so many people give up their pets every year. 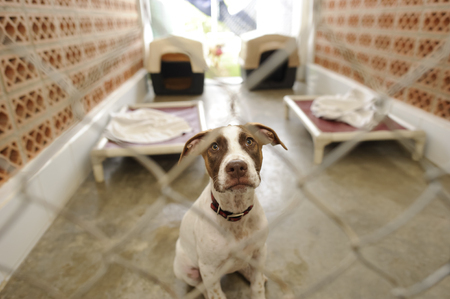 There are endless reasons that pet owners drop off their dogs, cats and other pets at shelters, but there is a common theme running through all of them. What are the top ten reasons and what do they have in common? Behavioral Issues – Some people turn over a pet to the shelter because the dog or cat has behavioral issues such as poor socialization, problems with housebreaking and lack of obedience. These pet owners become frustrated when they are unable to train their pets properly and turn over their pets rather than addressing the problem. Lifestyle Changes – Whether it’s a job promotion that means long hours away from home, a new baby, or changes in the family’s schedule, some pet owners drop off their pets in shelters rather than working with their pets to help them successfully adapt. Relocation – Moving into an apartment or house that doesn’t allow pets often leads to pets being dropped at shelters. The same goes for families moving across country or to a foreign country. Owners sometimes think it’s easier to get rid of the current pet and purchase a new one at their new address than to pay to transport their current pet. No Time – Underestimating the amount of time needed to properly care for a dog or cat is quite common, particularly with first-time dog owners. Pets that are left alone for long stretches often become destructive out of boredom. All it takes is a few chewed up pieces of furniture or some destroyed shoes for some people to decide that since they can’t give their pet enough time, they should get rid of them. Expenses – Just like with children, pets always cost more than anticipated. There are vaccines, illnesses, grooming, toys, food and more. It quickly adds up, and pet owners on a budget may decide to rehome their furry friends to save money. Old Age/Health Issues – Cute, rambunctious kittens and bouncy, playful dogs are popular family pets, but pets age more quickly than people. Some pets are dropped off at shelters when they get too old to play with the kids or they develop health issues that require extra time and care. Biting – Some families will work with a pet that has snapped at or bitten someone. Others aren’t willing to take the chance and immediately take a dog or cat that has bitten someone to a shelter in order to protect their family and avoid possible legal problems. Allergies – Cat and dog owners may not realize they are allergic to a pet until the animal has moved into their home. In other instances, a new baby or roommate may have allergies. If someone is severely allergic, the pet may end up at a shelter. Strays/Found Pets – Many people are willing to pick up a stray or take in a lost pet temporarily rather than take the chance of letting it continue to roam free. While this is a kind gesture, they may not intend to keep the animal forever and may turn it over to the local shelter, rescue or Humane Society after the first few days. Personal Problems – If an owner is going through a difficult divorce, a custody issue, a job change or the loss of a loved one, they may feel too overwhelmed to continue caring for a pet. If personal problems are consuming their time and attention, they may relinquish their pet in hopes that someone else will be able to better provide the time and attention their pet needs. There is a common thread to many of these reasons for turning pets into shelters – lack of preparation. Although some circumstances such as a new family member with allergies may be out of the control of the pet owner, most could be avoided with a bit of advance research and preparation. Consistent training, including pet costs in the family budget, researching pet breeds to find the right fit and a willingness to treat pets as family members can reduce the chances that pet owners will have to someday turn over their pets to a shelter. Other options, such as paying a dog walker to exercise pets while the owners are at work, can also minimize the chance that a dog or cat will become destructive. If you’re considering a pet, keep our Top Ten list in mind and address them before they become issues so that your pets will be “furever” members of the family.